I am an honest person, so I’m going to honestly share something despite it feeling a little superficial. Great workout apparel is one of the best motivators I’ve found to get me to exercise. There, I said it. The more-funtional, flattering, and colorful, the better. I love a good pair of running shoes atop a great pair of athletic socks. The right sports bra under a moisture-wicking tank can make all the difference. And, if you can give me a pair of running shorts with built in underwear and pockets? I’m practically in heaven! Give me the right gear and I’ve already got one foot out the door on my way to workout! So, today I share with you the best of the best. My absolute favorite workout pieces. As you will see, I am nothing if not loyal in my ownership of Nike and Lululemon threads, but that doesn’t mean you have to be. (although, I highly recommend it) What I do suggest, however, is finding something you like, be it a brand, style, or color, and stick with it. As silly as it sounds, master trainers suggest that wearing the right workout apparel can actually be motivating by boosting confidence and allowing you to feel more comfortable while exercising. I can surely attest to this. I have never hated a workout more than one I did in my living room in a pair of baggy sweatpants. Those pants are meant to be relaxing and never again will they grace the presence of a workout. And, on the flip side, I feel especially flexible during a tortuous Pop Physique session when I’m wearing my favorite lulu gear. Call me crazy, or even a product of consumerism, but it’s a proven fact in my experience. Below are my absolute favorites. I own many of these items in various colors and prints and might be lost without them. Descriptions to follow. Nike Lunar Glide Running Shoes: The are the best fitting shoes I’ve found for a well rounded workout. They’re great for jumping, twisting, lifting, and a little bit of running . Lululemon Cool Racerback Tank: If my budget allowed, I would have this tank in every color. It’s breathable, flattering, soft, and holds it’s shape no matter what! Nike Tech Capris: These are perfect for outdoor workouts on days that are slightly cool and bottoms that I wear for anything at the gym. Perfect for yoga, cross training, or running! Nike+ Sportwatch GPS: Now, I don’t own this one, but I did get one for my Dad last Christmas. As an avid runner, he swears by it. Clearly, it’s next on my wishlist. Nike No Show Training Socks: These socks, oh, these socks. I dread the days they’re all in the dirty laundry and I have to wear socks that don’t provide arch support. These guys stay in place, wick moisture, and feel great! Nike Pro Sports Bra: I don’t have the greatest need for support in the chest region, but I swear by this bra as do many women of all shapes and sizes. Much like the rest of the Nike lineup, this piece stays cool even when you’re hot. Nike Dash Running Short: These are those heavenly shorts with the built in underwear and pocket! All I’m saying, is don’t knock it till you try it! Lululemon Run Swiftly Long Sleeve Shirt: Living in FL, I don’t normally get a ton of use out of my winter workout wear, but this year was a cold one! I wore this top over EVERYthing and found that it kept me warm when I needed to be warm and cooled me down when I was ready. Nike Pro 2.5″ Compression Shorts: These little shorts feel like a second skin. The compression feature keeps your legs looking smooth and they move in every direction you do. Brussel Sprouts. A food most children (and many adults) automatically shudder at the thought of eating. A food so repulsive to immature taste buds that popular culture has turned them into the penultimate dietary punishment. A food that until recently, I thought I’d never eat. Until one magical night when my friend Paul hired the Big Wheel Mobile Food Truck to provide the food for his birthday party. Adam and I were informed of the deliciousness of his signature brussel sprouts by Paul’s children, and Adam having grown up eating brussel sprouts, we were convinced to order some. Let me tell you, that night changed my life! These things were delicious and hearty and crunchy and soft all at the same time. I couldn’t believe it! So, I journeyed on from that night thinking that so long as Big Wheel was around that I’d been keen to partake in some sprouts. Well, fast forward to Thanksgiving. My sister and her boyfriend were staying with Adam and I and we’d be tasked by our Mom to make some side dishes for the impending feast. I went with some of our family classics, but Jen decided to roast some brussel sprouts. Much to my amazement, yet again, those things were delicious! Simply prepared, those little miniature cabbages held their own amongst a crop of my favorite foods. However, it took me a good 4 months to work up the courage to prepare my own. I kept thinking, “What if I completely butcher this food that has taken me so long to love? What if I overcook them and they turn to mush? What if I undercook them and they’re hard as rocks?” Really, I was just making excuses to avoid cooking a food that intimidated me. Fast forward once again to present day: I am happy to announce that brussel sprouts are now a staple in the Weaver home! Seriously, I’ve made them 3 times in the last 9 days, and they’re on the menu again this weekend. And, the best part? The best part is that I’ve seasoned them in a totally different way each time I’ve made them and they’re always spectacular. They’re honestly so easy to compliment flavor wise. 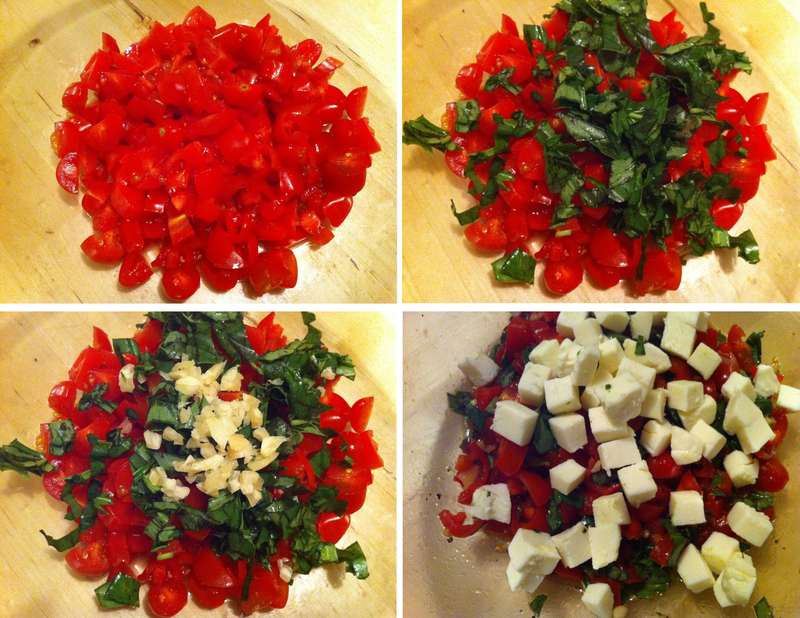 Below, I’ve shared one of the many ways I like to prepare them. It’s simple, fast, and fresh. So, you know the drill. Before I get to the how, I’ll share the why. Brussel sprouts are low in fat and cholesterol and a very good source of Vitamin C and dietary fiber. This means they’ll keep you full AND regular. Win-win! So, now that you’re in the know, I leave you with one of my go-to ways to prepare brussel sprouts. I encourage you to experiment with your own flavor profiles. They’re are infinite ways to prepare these sprouts, so I’m certain you’ll find a way you love! Normally, the recipes I share with you are some variation of a recipe I’ve used from an almighty cooking source much greater than myself. On occasion, I’ll even share a recipe that has come straight from my own brain. 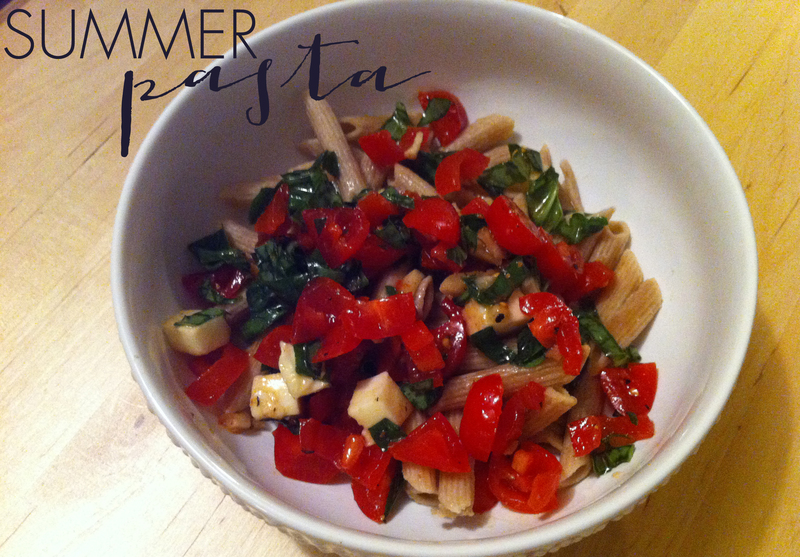 And, very, very rarely, I will share with you a recipe that I straight up copy. Today is one such time. I mean, I follow the recipe so precisely that I can’t even comfortably tell you how to do it from here. I must direct you to Oh She Glows, an amazing blog for anyone who enjoys a good, hearty, healthy, nutrient-filled recipe! 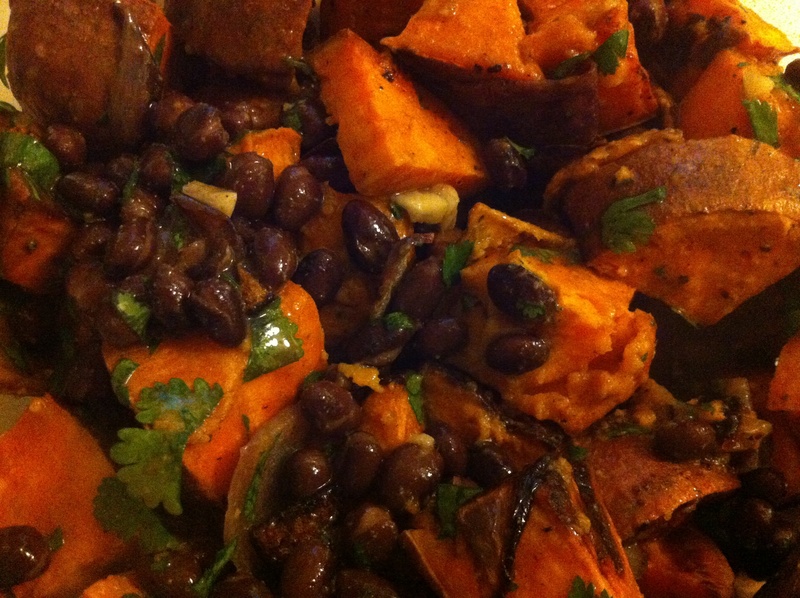 I would like to introduce you to the “Roasted Sweet Potato and Warm Black Bean Salad.” And, I’d like to tell you how much I love it before I share the recipe link to you. The love I have for this dish not only comes from a place of extreme gratitude for its flavor, but for its nutritional content as well. 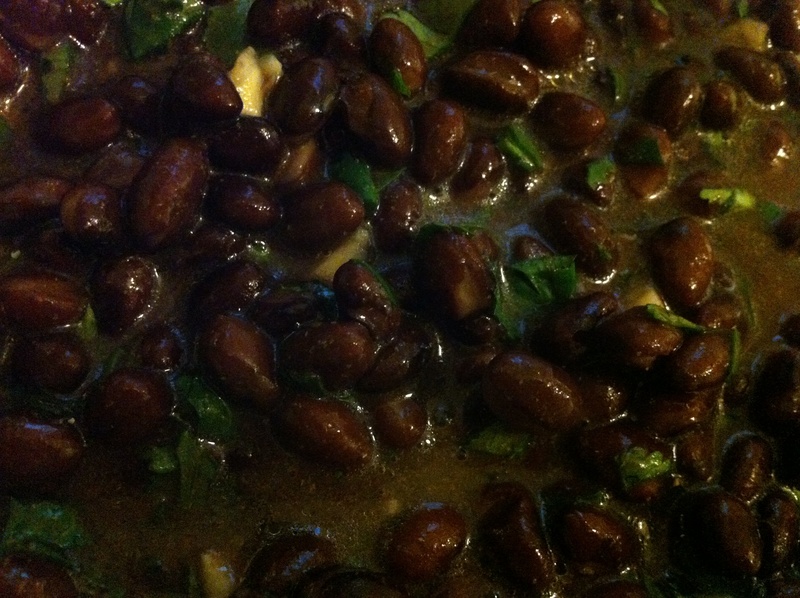 As the name suggests, it’s made up of mostly sweet potatoes and black beans. 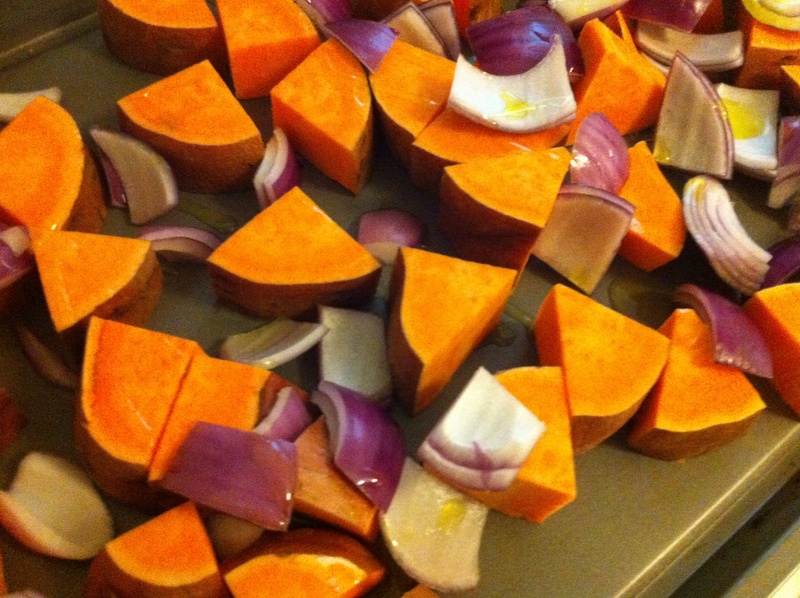 If you recall, sweet potatoes are stuffed with nutrition and black beans are a solid choice as well. Full of protein and dietary fiber, these low saturated fat and low cholesterol little bits are an awesome choice for a healthy meal. And, did I mention that this dish is incredibly flavorful? My mouth waters just thinking about it! So, do yourself a favor, and whet your appetite with the photos below then get your booty over to Oh She Glows for the recipe. Yesterday was Palm Sunday, the beginning of Holy Week, the celebration of the last week Christ spent on Earth as humble man. This is always an emotional week for me. It is one that reminds me of my depravity as human. As sinner. As selfish being. But, and so much more importantly, it is a week that reminds me of the INCREDIBLE, BEAUTIFUL, ENORMOUS gift of salvation that Jesus paid by dying on the cross those two thousand some years ago. It is a week of emotional highs and lows. Jesus triumphantly rides into Jerusalem as throngs of people bow down before him, singing his praises. The King of Kings washes the feet of his disciples, with and for whom he breaks bread for the last time. Then, for a paltry sum, Jesus is betrayed by one of those very men. Later that night he is denied by Peter, the rock on which his church will be built. The Prince of Peace is mocked, persecuted, beaten and sentenced to death. He is hung on a cross, laid in a tomb, and then, against all odds, against all logic, against all sound judgement, HE IS RISEN!! He not only defeats death for himself but for ALL of humanity! Yes, I would call that an emotional week. It is a week that I look forward to celebrating every year, but one which I should really be celebrating every day. It is a week that changed the course of human history for all of ETERNITY. So, I encourage you to celebrate with me this week. I encourage you to take some time and think about the weight and power which Holy Week represents. Jesus is RISEN for you and for me and for every single sinner who defiantly walks this Earth. I encourage you to listen to the song below as well as meditate on its lyrics. Written and produced by Hillsong, it was played at our church yesterday morning and moved me deeply. It is an incredibly powerful expression of the fullness of Holy Week. Hillsong has deemed “Man of Sorrows” this year’s Easter Song and it is available for free download here. Finally, if you do not have a church to attend on Easter Sunday (3/31/13), I would love to invite you to join Adam and I at our church Grace Orlando. There are several campuses and service times from which to choose. Everyone, and all of their emotions, are welcome!